After a lot of speculation about the grain direction of these component, the soundboard doughnut in particular, I took the plunge and started making them. 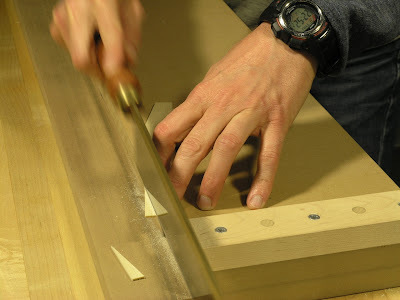 The bridge graft will be the only one running cross grain, the soundhole doughnut and the grafts under the fingerboard will both have the grain running parallel to those of the soundboard. Why? Well, it seem that most builders do it this way and so I sheepishly followed. 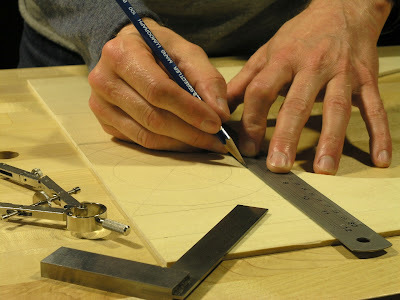 I started by drawing up the grafts of the soundboard cut-off, trying to position the components on the best, most vertically grained area, and at the same time trying to group them together leaving as much of off-cut intact, in case I needed to redo some of them later. 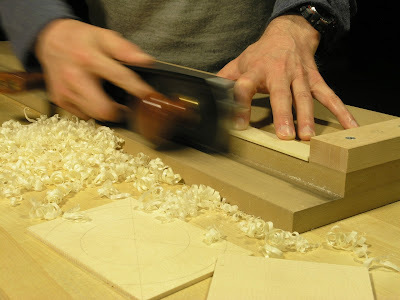 Once the grafts were drawn up, I cut them out with my dovetail saw and jointed the edges to final dimension. Both these task were done 'freehand' using the shootingboard as support. 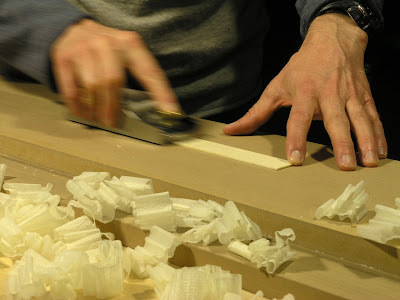 Once that was done I stuck the grafts on to the shootingboard with double sided sticky tape and planed them all to final a thickness of 2mm using my block plane with a 38º blade. This little plane is a true gem and now that I have the full set of blades to go with it, it is an incredibly versatile little setup. 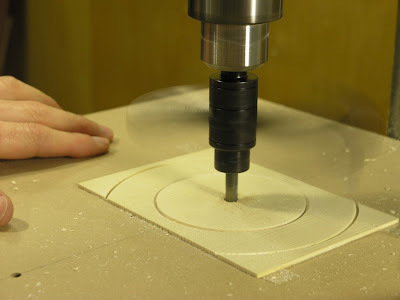 The soundhole doughnut was cut using a drill press fly-cutter I bought a while back for this very purpose. I had to sharpen the blade and it was quite an ordeal doing this by hand, but I got a mirror finish on all three faces in the end. 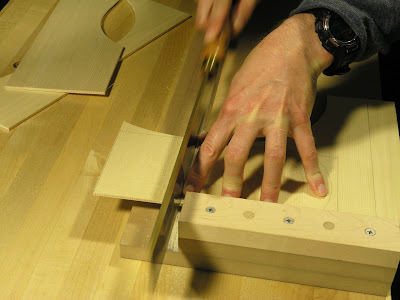 My intent was to use the angled part of the cutter to create a slightly beveled edge, partly because of aesthetics but also because I have read somewhere that the air in the body will be able to pump in and out more efficiently this way. I soon realized that this was easier said than done. If I just turned the blade around to cut the inside bevel, the blade would also be cutting 'backwards'. To do inside bevel properly I would have to, either do some major surgery to the blade or have two blades, one for an inside bevel and one for an outside. But, as it was late and I was so close to finishing up I decided to do the unspeakable and have the inside bevel done with the blade running backwards - Yikes! However, Spruce is rather soft and it actually did kind of work, with a little bit tearout though. All in all I found the fly-cutter a bit of an awful beast to deal with. It is a big and sturdy model made by General and as it only has a cutter on one side it through the whole drill press out of balance, cutting with a lot of vibration. As I said the cuts themselves were fine, but the whole thing was a very wobbly and rather unpleasant affair. I might use my StewMac circle cutter next time. I finished the bridge graft by trimming the ends with a slight angle. 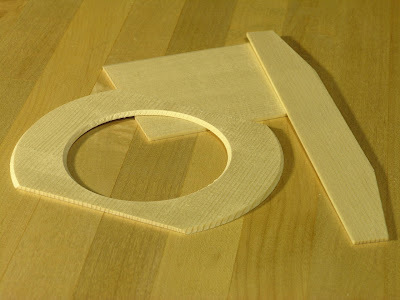 The little triangular cut-off will be saved for later use as guides for trimming the underside of the fan braces where they cross over the bridge graft. The fingerboard graft was left to be trimmed for final fitting later. how do you go about making them?